In 1960 Mary Hanley forced open the wedged shut door of the cottage at Thoor Ballylee. She walked into the large damp room. For 12 productive and happy summers, the cottage and its adjoining Norman tower had been the home of WB Yeats , his wife George Hyde Lees, and their two children Anne and Michael. Now, however, the floor was covered with manure. For years it had been used as a cow barn. Pulling aside stones that had blocked exits to keep the cattle enclosed, Mary walked into the dining room, with its magnificent enlarged window overlooking the Streamstown river as it races under the four-arched bridge. She climbed the narrow winding stair, its walls still showing the strong blue colour painted by George in 1919. As she climbed, she noticed the fine fireplace in one room, the noble vaulted ceiling in another, the slit windows, the little secret room, and the crows’ nests on the window ledges. She emerged on the roof in strong sunlight. Looking out from the battlements over the gently rolling fields of south Galway’s stony pastures…she knew instantly why Yeats was drawn to Ballylee. Shortly after moving in, Yeats wrote to his friend John Quinn: ‘It is a great pleasure to live in a place where George makes at every moment a 14th century picture. And out of doors, with the hawthorn all in blossom all along the river banks, everything is so beautiful that to go elsewhere is to leave beauty behind’. But it was more than just a place of beauty for the poet. Ballylee was the haunt of the wandering bard Anthony Raftery, the home of the fabled Mary Hynes, and it was close to his life-long friend Lady Gregory and Coole, which was his second home. The ownership of an ancient tower gave him and his family protection from a violent history, from storms and ‘every wind’; while its winding stair led to another world under the stars. It satisfied his instinct for the mysterious, for nature, and the dream world. He wrote his best poetry there. Wonderful Mary Hanley, however, knew exactly what to do. In 1961 she founded the Kiltartan Society. During its first meting, held at Coole Park, it was agreed that Thoor Ballylee would be rescued from ruin and restored as a monument and an icon to the poet. Anne and Michael Yeats gave the project their full blessing, and Bord Failte, now Failte Ireland, employed a team of experts to restore the Thoor. The poet Padraic Colum officially opened the tower Sunday June 20 1965, the centenary year of the poet’s birth, exactly 50 years previously. And Failte Ireland continued to operate the tower as a tourist information centre until 2009 when extensive flooding closed the building until now. South Galway has always taken pride in its unique cultural heritage. Already The Lady Gregory, Yeats Heritage Trail, linking Kiltartan Museum, Kilmacduagh, Coole Park, Woodville walled garden, Killinane graveyard, Roxborough and St Brendan’s Cathedral, Loughrea, offer an interesting and informative link attracting visitors and local families to explore their own history. I am personally a bit fed up at all the money spent developing the Wild Atlantic Way. What a pity if visitors come to Ireland and only see the ocean, spectacular as it may be in places, and miss out on a major part of our literary heritage. For far less money a Yeats trail could be signposted, linking Sligo, Lissadell, Renvyle House Hotel, Coole Park, Thoor Ballylee and joining the Gregory/Yeats trail already developed. All the above places have an association with Yeats, many of them appear in his poems, and biographies. 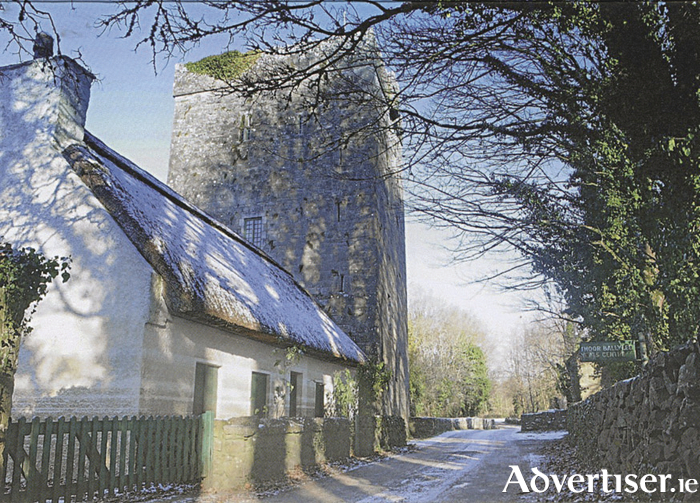 However, with Burren Lowlands (a development association ), and a local group is now renovating Thoor Ballylee. Thanks to the cooperation of Failte Ireland, Thoor will reopen on Saturday June 13, the 150th anniversary of the poet’s birth. A day long celebration is planned to include Kiltartan, Coole Park and Thoor Ballylee. The Galway poems of WB Yeats.